The Domesday Survey of 1086 mentions two priests at Stoneleigh, but of the church of that time we know nothing. Whatever building there was, it was probably of wood and was rebuilt during the first half of the 12th century, but it took the Church of Saint Mary the Virgin seven hundred years to become as we know it today. Centuries have passed and it still stands overlooking a village that is full of the past but living in the present and represents eight hundred years of births, marriages and deaths. 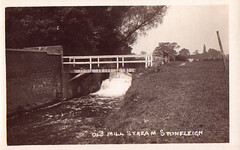 Many of the old village names are on the headstones in the churchyard and are the subject of research by the Stoneleigh History Society.. The building is of red sandstone and essentially Norman. The chancel arch is perhaps one of the finest features of the church. Beyond the arch lies a monument, erected in 1668, to a proud lady with a bitter story and one of the few Englishwomen made a Duchess in her own right. 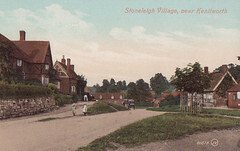 Duchess Dudley, who was born in 1578, was the daughter of Sir Thomas Leigh of Stoneleigh. She married Sir Robert Dudley, the illegitimate son of the famous Elizabethan Earl of Leicester. Later he abandoned her, living the rest of his life in Italy. She lies with her daughter Alicia, one below the other, both exquisitely carved in marble . Also on the north side of the chancel is a monument to an unknown priest which was discovered in the churchyard when the foundations of the Leigh Chapel were laid. The effigy of a woman which lies in the porch was also brought in from the churchyard. The details of this are almost obliterated, but she is said to be holding a child. The font is a good example of 12th or late 11th century work. 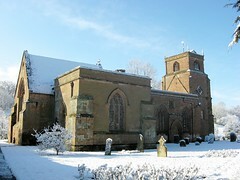 It is said to have been brought from Maxstoke Priory where it lay amid the ruins for more than 250 years. It replaced another Norman font, which is recorded as still being in the church as late as 1803 and was probably removed during .the extensive repairs between 1811 and 1825. The organ originally dates from the 18th century and was presented to the church in 1859 by Chandos Lord Leigh. 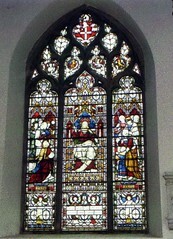 It was removed from the south aisle, rebuilt and enlarged in 1968 and replaced in its original position in the gallery. There are six bells and details of these are recorded in the tower porch. Early 19th century fixtures and fittings include panelled box pews and pulpit, together with the fine cast iron Royal Arms on the west gallery. The hatchments in the nave and chancel are all to members of the Leigh family and date from mid 18th to the mid 19th centuries. 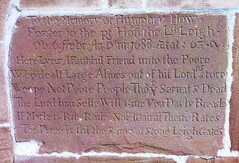 On the outside of the church, on the south wall, the inscription to Humphrey Howe, porter to Lord Leigh in 1669, ought to be read. This tablet was originally in the old south porch and has now been inserted into the blocked doorway. 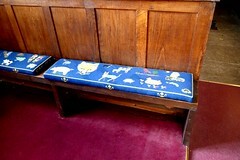 In May 1990 a group of parishioners decided to work tapestry cushions for the church pews. A pair of each design was made, each cushion consists of 80,000 stitches and the patterns have all been designed by local people, using either religious or natural symbols. Over forty people worked on them and the first six cushions were dedicated by the Rector, David Webster, at Harvest Festival Songs of Praise on October 1st 1990. 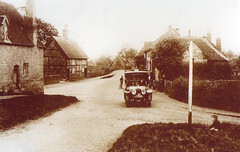 (Information based on the booklet Walking around Stoneleigh-in-Arden – A Village by Audrey V Gilbert). The booklet is available for purchase in the church, which is normally open to visitors between around 10am and 4pm. More photos of the Church can be found here.